Rock Band Returns To Paris To Finish Show; Frontman Pans France's Gun Laws : The Two-Way "The only way my mind has been changed is maybe that until nobody has guns everybody has to have them," lead singer Jesse Hughes tells a French TV show. 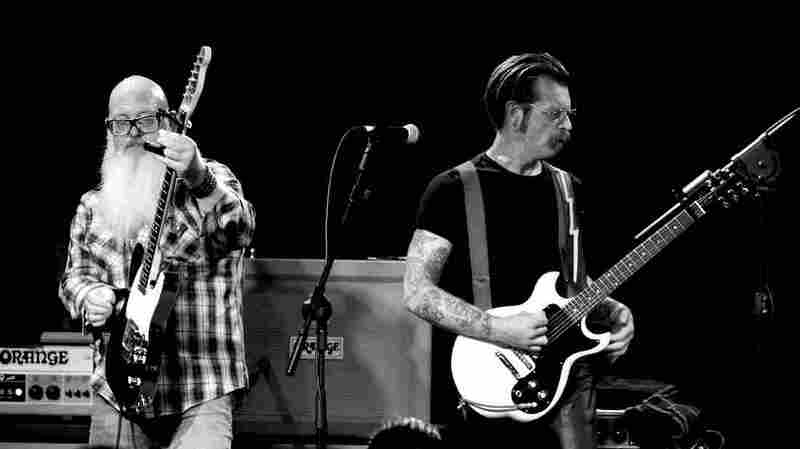 Musician Jesse Hughes (right) and the rock band Eagles of Death Metal will play in Paris Tuesday night to finish the show that was interrupted by gunmen three months ago. The remarks came during an extended interview in the studio of French TV station iTélé, in which Hughes was at times weeping and emotional; in it, he declared himself "a raw nerve" and said he and his band were overwhelmed by the support they've received in Paris. Hughes, a gun owner who has in the past spoken out against restrictions on guns in the U.S., called the French people "incredibly strong and determined" — but he also said the country's gun laws didn't save anyone from dying that night in November. The singer said that the only thing had stopped the violence was "some of the bravest men that I've ever seen in my life charging head-first into the face of death with their firearms." "I know people will disagree with me," he said, later adding, "I hate it that it's that way." 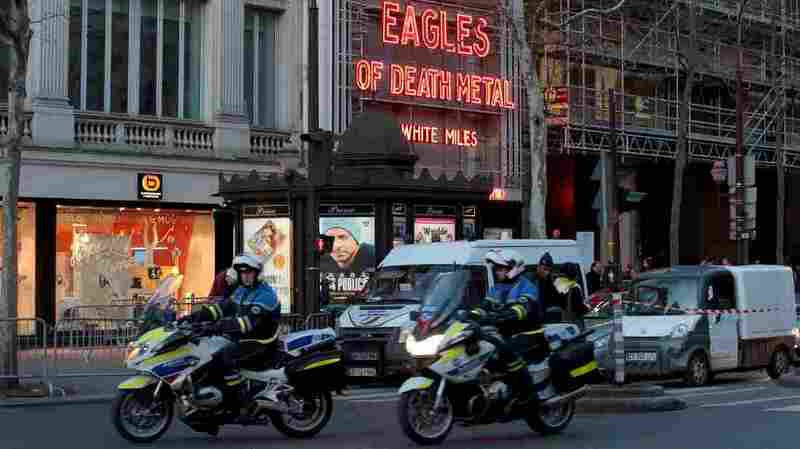 Police drive past the Olympia concert venue in Paris a few hours before a makeup concert by U.S. rock group Eagles of Death Metal on Tuesday. "The only way my mind has been changed is maybe that until nobody has guns everybody has to have them," Hughes said. Saying he didn't want to see such an attack again, he added, "I want everyone to have the best chance to live. And I saw people die that maybe could have lived, I don't know. But I wish I knew." "Survivors of the Bataclan have been offered free tickets to tonight's show at the Olympia theater, where police, soldiers and psychologists will be on standby. "The Bataclan, where 90 people were killed, has not yet reopened, but the owners have said they hope to host events before the end of 2016." Hughes says he understands why anyone who was at the show in November would decide to stay away from tonight's concert. But he said he feels a "sacred duty" to finish the band's set. In a separate interview with Le Parisien, Hughes struck a slightly more moderate tone in his remarks, saying: "I support the right of all to carry a weapon to defend themselves. The arms help to defend themselves, right?" He concluded that interview by saying, "Me, my only weapon is my guitar. And my guitar kills a*******." This isn't Eagles of Death Metal's first time back in Paris since the deadly attacks; the group accepted U2's invitation to play at their show in Paris in December, just weeks after the attacks.